The gateway to the west is an eerie, rugged and alluring moonscape. Queenstown is surrounded by the scars of its rugged mining history. 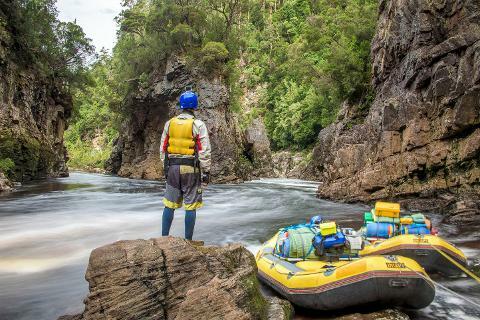 Right at the western edge of Tasmania's World Heritage Wilderness Area, lay an ethereal moonscape of stripped hills and mountains. Logging and copper mining in the early 1900's have left Queenstown's surroundings bare, colourful and beautiful. Queenstown sits in the west of Tasmania making it a long drive from all of the island's biggest cities. Devonport is a 2.5 hour drive and 196 kilometres away. It's over 3 hours to Launceston which sits 244 kilometres to the east. 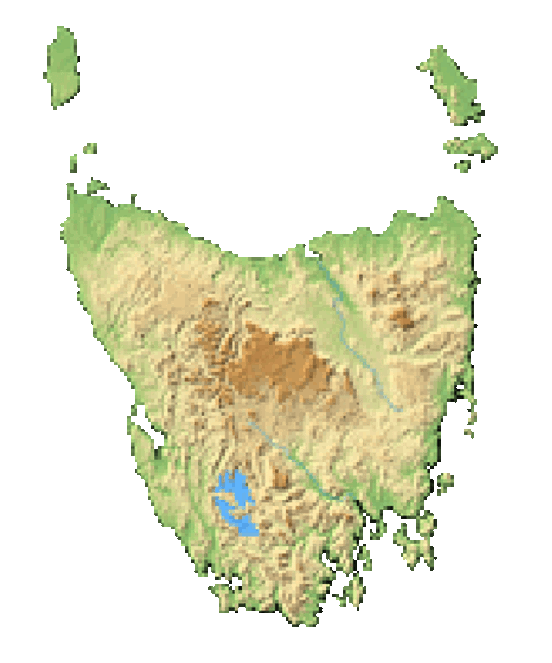 Hobart is 260 kilometres away and is 3.5 hours by car. 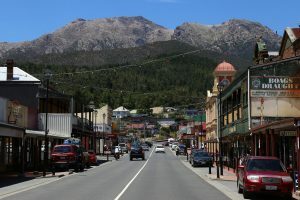 Queenstown is on the hire car circuit around Tasmania, so the city draws many tourists. 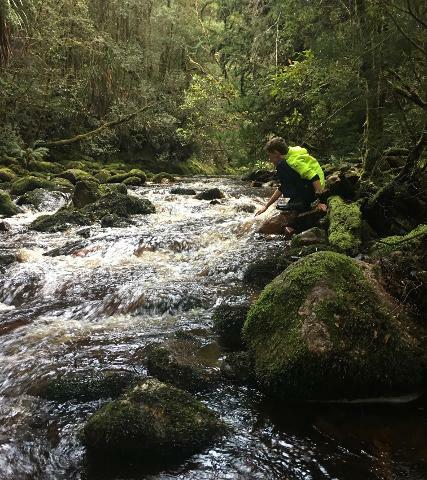 And organised Tasmanian tours go out of their way to take clients through this rugged moonscape. There is simply no other landscape like it on earth. While mother nature continues to heal Queenstown's brutal mining past, the town itself has plenty of attractions. The city is crowned by towering and beautiful mountains waiting to be explored. The gravel football ground adds to Queenstown's rugged history. Orr Street, Queenstown's old Main Street, is incredibly preserved and lined with closed pubs that were once patronised by Tasmanian copper miners. And Queenstown offers up a local history museum that allows you to see just how this barren landscape was created. 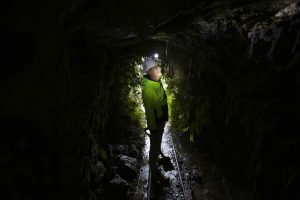 Visitors flock to Queenstown to get a feel for Tasmania's mining history. You can take an underground mine tour or a stroll through the local history museum. 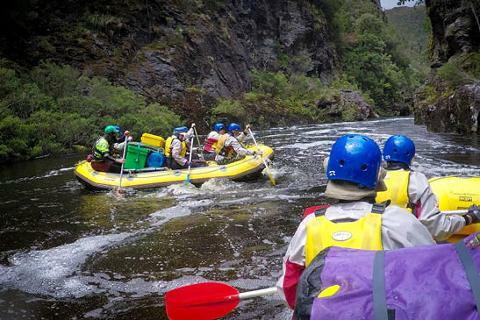 And Queenstown borders some of the most picturesque wilderness Tasmania has to offer. You're likely to find plenty of hikers making Queenstown their base camp before venturing off into the mountains. You'll find plenty of passersby in Queenstown. 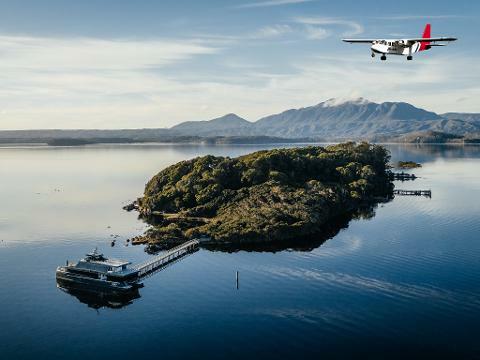 After all, the city is the gateway to Tasmania's west. But passersby are quickly enamoured by the incredible landscape all around and some scurry to make arrangements for a longer stay. Hikers love Queenstown, as it's a unique base camp for adventures into the nearby wilderness and draws the curious traveller. 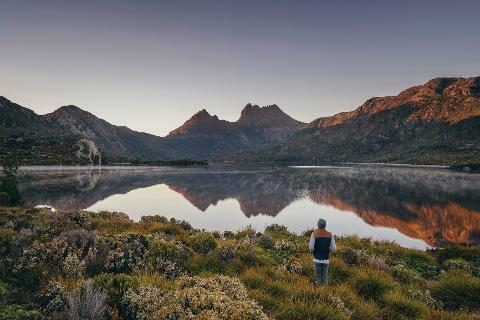 With its incredibly unique landscape, you'll find intrepid travellers from all over the world who have come to Tasmania just to marvel at the hills and mountains scarred by Queenstown's mining past. 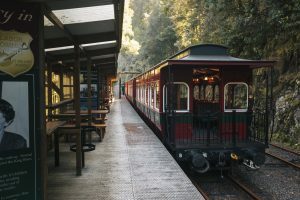 The West Coast Wilderness Railway cuts through the rainforest all the way to the coast. The train runs through the King River Valley while traversing gorges and climbing a steep grade. The track was built between 1894 and 1896 by 400 intrepid men. 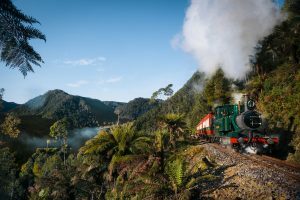 Now you can enjoy this railway to see the wilderness surrounding Queenstown. The Mount Lyell Underground Mine Tour takes you 6 kilometres into a nearby underground mine. The tour takes groups of 2 to 6, lasts three hours and children under the age of 14 are not allowed. The Empire Hotel features a beautiful Tasmanian Blackwood staircase. Opened in 1901, this hotel at 2 Orr Street is a beautiful reminder of Queenstown's opulent past when wealthy mining magnates would stay in town for long periods of time. The Galley Museum is inside Queenstown's first brick hotel. 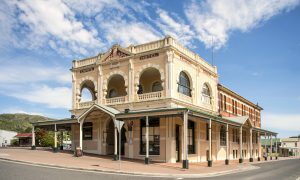 The building has an incredible history as a hotel, hospital and mining accommodation. Tour the museum's seven rooms to marvel at over 800 photographs of Tasmania's west Coast mining history. The Gravel Football Oval (known locally as "The Gravel" or "The Rec") is a sport's arena for Australian Rules Football. Marvel at the toughness of Queenstown's miners who would brave the gravel playing one of the world's most brutal games. A grass oval would have simply become mud with Queenstown's incredible annual rainfall. Instead of forgoing the game, the rugged men of Queenstown decided to play on gravel instead. And they would walk away with the scars to prove it. The Mount Lyell Enviro Tour takes visitors to the edge of town to see the rugged moonscape up close. You'll also get a guided tour through the town's most historic sites as well as Queenstown's modern tailings treatment system. There are plenty of local restaurants and cafés in the heart of town. Each has a name playing with Queenstown's mining past. Or you can choose to stop at one of the many hotels on the way into town for a plate of hearty pub food. The first surveyors of Queenstown's land classified it as dangerous and difficult country. But in 1881, gold was found in Tasmania's Queen River. Miners soon flocked to the area. By 1888, the Mount Lyell Gold Mining Company was founded. Queenstown's destructive smelting soon began and its moonscape began to take shape. Copper was found in the hills around Queenstown and 11 furnaces were built around town by the early 20th century. Sulphur fumes from the smelting of copper began to destroy Queenstown's flora and fauna. The smelters consumed over 2,000 tonnes of timber per week until the landscape was consumed. By the time the first road to Hobart opened in 1932, Queenstown was a beautiful man-made disaster. The Darwin and Crotty dams were built in the 1980's to create nearby Lake Burbury. While the lake is now a beloved fishing and recreation area, the building of dams has ceased due to environmental concerns. Avoid the crowd at the Spion Kop Lookout by heading over to Gormie Hill for an equally impressive lookout. The Queenstown Heritage and Arts Festival takes place every other year and is colloquially known as the Unconformity Festival. 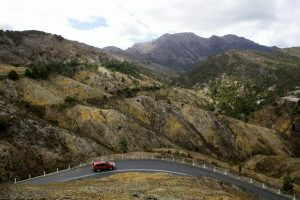 Stop at the Views of the Valley on your drive into town on the Queenstown-Hobart Road. It gives you uninterrupted views of Queenstown's brutal mining history. Visit the nearby Gormanston mining ghost town. About 10 families still live in this historic town which is 6 km from Queenstown on the Lyell Highway. You won't see any residents in the mining ghost town of Linda which sits 8 km east of town. The Royal Hotel closed in 1952. 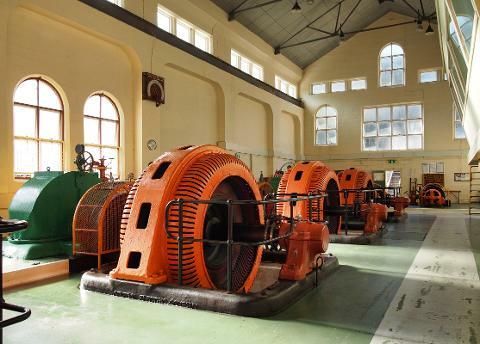 The Lake Margaret Power Station is the oldest hydroelectric scheme in the country. It draws power from the Yolande River 10 km north of Queenstown.